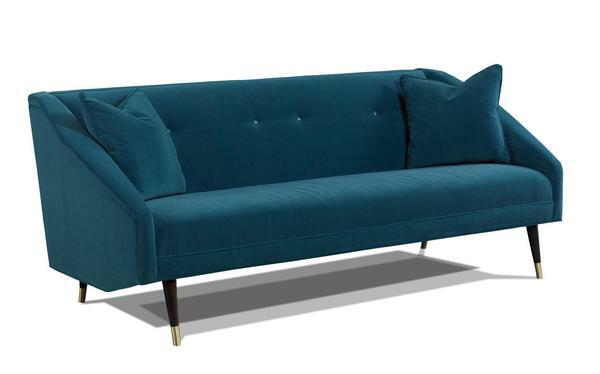 The Finnick Sofa by Precedent brings forward vintage style with a new modern twist. This contemporary style sofa invites you to lean back against a rich sofa back that wraps you right up in its softness. A single line of button detail that's generously spaced on the sofa back creates the simple and contemporary lines that always look fresh and tidy. Cone shaped legs made of kiln dried hardwood are angled to attract, with your choice of finish contributing to your decor. Upholstery Options include Standard, Performance Plus or Specialty Fabrics. Performance Plus Fabrics are treated with Crypton technology, making them stronger and more resistant to stain, odor and wear. Feel free to order samples to work with at home.